All around the country in these early weeks of December, churches and cathedrals are echoing to the beautiful strains of choral music. The tradition of Christmas carols dates back centuries, but their enduring appeal in an increasingly secular era is remarkable. And while for most of us, church choral music is a festive treat, for many others, it's a year-round pleasure. 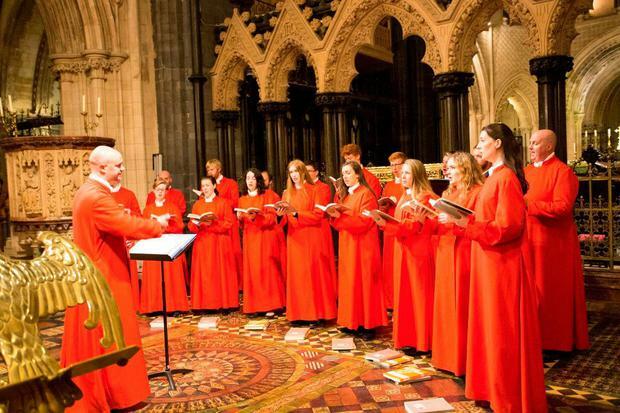 The choir at Dublin's Christ Church Cathedral sings the liturgy there five times a week at 6pm, every week of the year. In December, the music charts the advent of the birth of Christ, and evensong is 'religion as theatre' - sublime choral music in a sacred space, with a candlelit procession of staff-wielding churchwardens and reverends in brightly coloured robes. "People love a good story," says Ian Keatley, organist and director of music at Christ Church Cathedral, "and that sense of a narrative building towards a climax - in this case Christmas Eve - is particularly noticeable during Advent." The choir is made up of 22 men and women, mostly drawn from the city's universities. "But we also have a choral mentoring scheme where people with innate talent, but poor sight-reading skills, will be trained free of charge so that after a year, they can try out again," adds Keatley. It's an SATB choir (soprano, alto, tenor, bass). "Different conductors use different voices in different ways, but often the sopranos and tenors tell the story of the song, the altos bring the drama and the bass might lay out the sense of foreboding." Despite the fact that attendance at local parish churches is dwindling, these special Christmas services in our biggest cathedrals remain packed out. "We live in an increasingly secular society, but people are drawn to the church, especially at this time of year, to hear this beautiful music," says Keatley. "Our 'Carols by Candlelight' series will sell out by August, but we do pretty much the same type of music for free right up until the first week of January and there are sung masses every day, other than Monday and Friday, throughout the year." Keatley believes that the atmosphere and artistry in cathedrals separate them from the struggling suburban churches. "You can come in and maintain a relative level of anonymity. You can listen to some of the top vocalists in the country creating this incredible sound while looking at the beautiful architecture, designed specifically to accentuate this music. "This is a tradition that goes back centuries, that stimulates all your senses, and to engage with all this history and tradition in such a remarkable building has a powerful effect on your spirit." All that is required of you is to be in the moment, not on your phone. "Take one hour, just to be with yourself, interacting with what you see and hear. It's a form of mindfulness." Capturing the right emotion is a vital part of Keatley's role as conductor. "You have to work on the tuning, balance and rhythm of the voice. But sometimes that's all there and I am just not feeling it. So I'll stop the choir and tell them 'I think it's because you are not imagining the text described, or what the composer had in their mind'. It's like acting; you almost need to get into character to properly transmit the emotions. I'll strike them up again and, magically, the feeling will be present." People can find themselves unexpectedly affected when they hear the choir. "People are just desperate to be connected to their past. Choral music, and particularly Christmas carols, uses techniques to lead your emotions. These songs can envelop us in nostalgia, unlocking thoughts, smells and feelings we haven't experienced in years, even if it is only happening on a subconscious level. You'll feel better, but you don't know why." Choral singing can have an overwhelming effect on the singers. The High Hopes Choir was founded in 2014 by David Brophy, the principal conductor of the RTÉ Concert Orchestra, and is made up of people who have been touched by homelessness. "Brothers and sisters/When they insist we're just not good enough/Well we know better/Just look him in his eyes and say/We're gonna do it anyway. "…I will automatically look at every member of the choir and think about how far we have come, how much we have achieved and how proud of every one of them I am." Since forming, they have performed for Michael D Higgins, at the European Parliament in Brussels, and at Electric Picnic. "We've become like a family to one another. Everyone opened up about their personal stories as we've been through so many similar experiences, so we've been able to support each other through the good days and the bad. It's stopped people getting isolated, given us a social outlet, got them out of their houses, mingling with the community." There are 87 members altogether, spread out over Dublin, Cork and Waterford, and they practice once a week on a Tuesday. "A lot of people have mental health problems and it can be hard for members to retain the information. So we practice and practice and practice. People still forget the words, but we don't panic as the person to your left or right will remember and help you." Emma, who is also in assisted living and has been in the choir since the start, says that other members look to her and Kataleena as the sopranos to prompt their cues. "They look at us a lot, so we have to remember all their cues on top of our own." It means she gets to see the reactions of a lot of her choir mates when a song is having an effect on them. "You can see it in their expressions. We'll be singing the same song and one will have a big happy face and the other will have tears in his eyes." The choir's director, Glen Alexander, is on hand if the emotion ever gets too much. "We do a song called 'Fix You', which really resonated with a lot of the members of the choir and it upset them." Being part of the choir has made Christmas a welcome presence in their lives once again. "A lot of them would have walked the streets at Christmas, looking at the lights and decorations and thinking of happier times," says Glen. "Now a lot of the choir members are in assisted accommodation and they look forward to doing up their own apartments, while it's the one time of year family members might let them come home." "I grew up in State care, away from my family," says Kataleena, "and at Christmas, all you want is to be with your family. So it brings up a lot of memories when you see everyone else with theirs. But since I've been with the choir, I have a family back in my life. We make new memories. It's important." 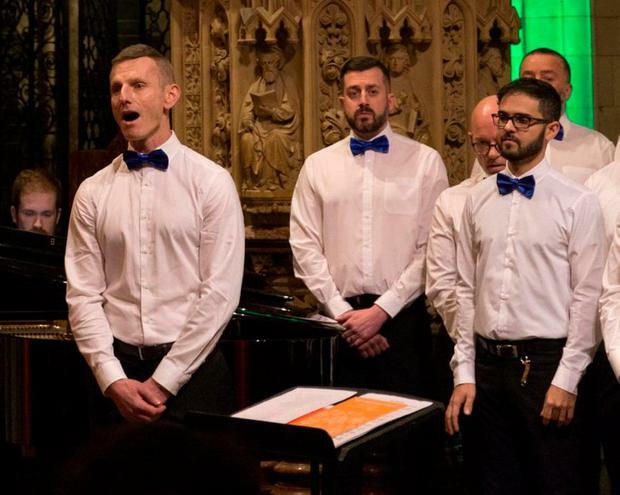 For some members of the Dublin Gay Man's Chorus, the Christmas period has become an essential part of their lives. "A lot of people may have had dark days in the past with their families," says chairman James Roulston. "This gives them a chance to actively involve them with a big part of their lives they may not usually get to see. "My own family travels up from Donegal to see me perform every Christmas. It really brings people together. "I think singing together as a group is not like any other experience," says Fabian McGrath, a long-standing member of the choir. "People use the word spiritual and you do get an actual lift out of it. "You might feel tired before practice and when you leave, you are feeling so much better. There's something healing within it, that resonates within you."